June is here, the days are getting longer and warmer, and I’m bringing out my white jeans, sandals, and other summer clothes. 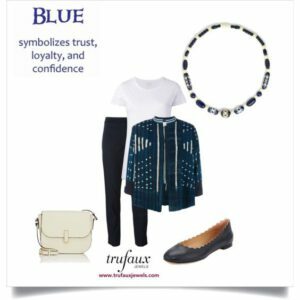 This month is also the time to bring out summery jewelry: lighter-weight pieces in white, coral, turquoise, spring green, yellow, and other colors associated with warm weather. For me, summer jewels are also pieces that make me smile because they’re just fun to wear. 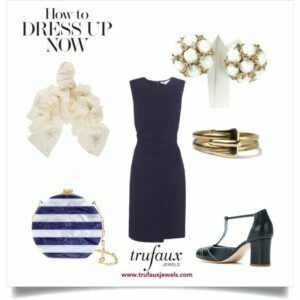 So here are some outfits styled with summery vintage jewels, to inspire you to have fun with jewelry this season. I always enjoy wearing long earrings that swing as I move. Here are two pairs that work especially well with a summer wardrobe. 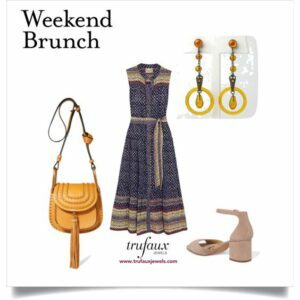 In Weekend Brunch, these Apple Juice Celluloid Art Deco Drop Earrings adorn a dress for a smart-casual or office look. Made from an early plastic in the 1920s, these 2 ½” long screw-back earrings are especially lightweight. 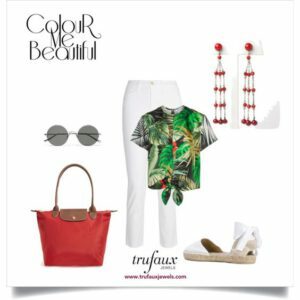 In Colour Me Beautiful, I played up the red in the colorful blouse with Red Bead Art Deco Chandelier Earrings and a red bag for another smart-casual outfit. These screw-back earrings are simply divine at 3 ¼” in length! Both pairs of earrings can be modified for pierced ears. 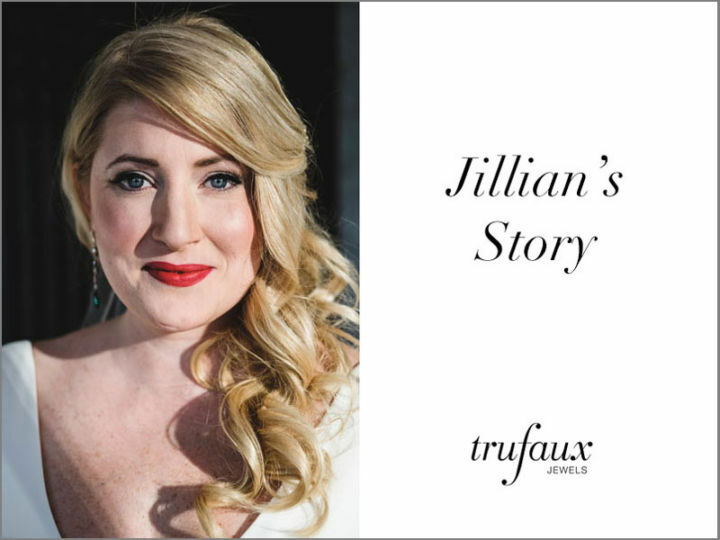 If long, swinging earrings aren’t your style, here are two pairs of ear clips in white. How to Dress Up Now features Milk Glass, Diamanté & Gold Wire 1950s Earrings by Hattie Carnegie. I added a Gold 1940s Double Flexible Spiral Cuff to complement the gold-tone wire in the earrings. Put on a blazer to wear this ensemble to the office. 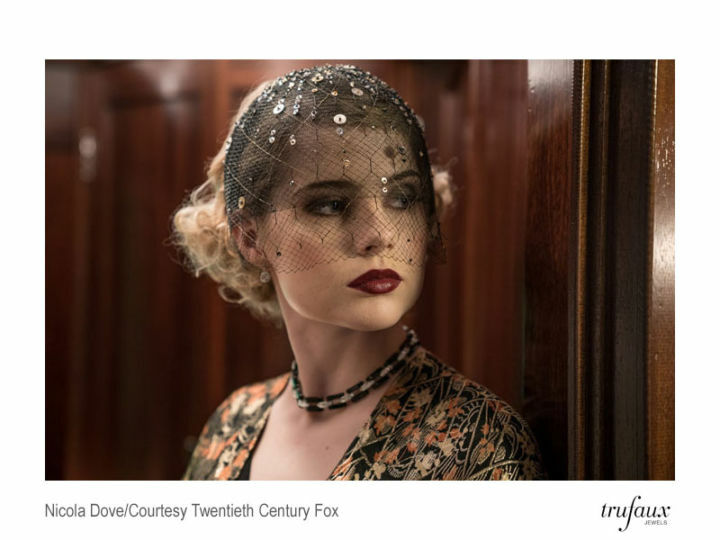 The Polka Dots in this dress on the right made me think of the beads in these Milk Glass Bead, Diamanté & Gold Machine Age Earrings by Miriam Haskell. Here, again, I added a gold-tone bracelet – this Gold Flexible Spiral 1940s Bracelet – to complement the gold in the earrings and the studs on the handbag. 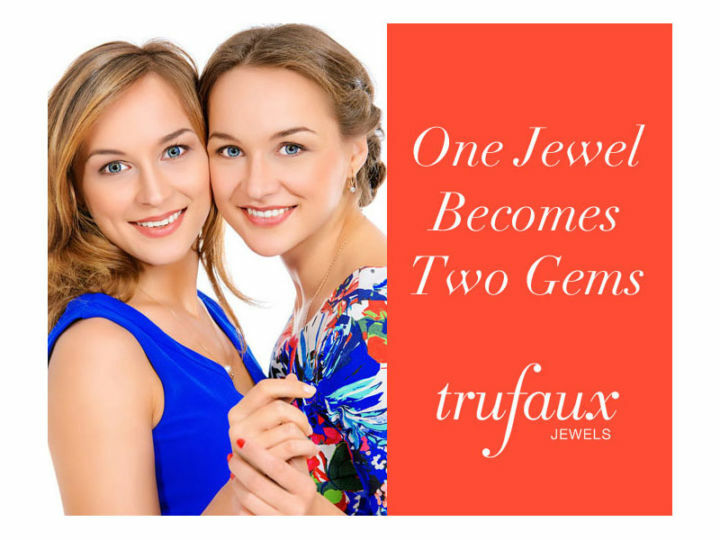 For both outfits, you could substitute a gold bangle or a real or faux diamond tennis bracelet, if you have one. Here are two lightweight necklaces that are just right for on- and off-duty attire. In Summer, the dainty Coral Bead Fringe Art Deco Necklace pairs well with silver hoop earrings, jeans, a tee shirt and your favorite cardigan for a well-put-together casual look. 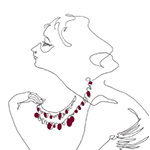 I’ve chosen coral to complement the necklace, but any color from the warm palette would work well. Blue, on the right, shows this Blue & Cream Galalith Art Deco Necklace, which is made from molded plastic beads that look as though they’re carved. This necklace works well with trousers and a jacket, jeans and a tee shirt, and a dress. This Chrysoprase, Onyx & Red Glass Art Deco Brooch is definitely a Statement Piece! And it’s fun to wear! 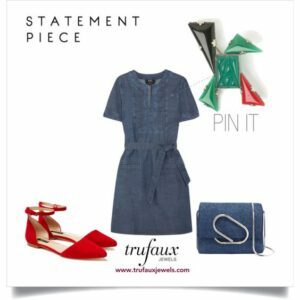 I’ve styled it simply with a denim dress, red shoes, and denim bag. 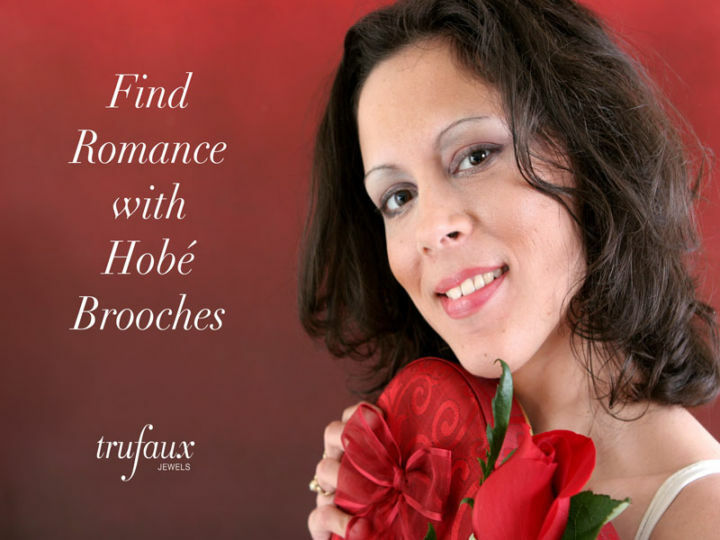 Wear this brooch when you want to start a conversation. For a more elegant look fit for a Date Night Beauty, fasten this Coral, Pearl & Gold 1950s Brooch to the waistband of a dreamy dress. Designed by Hattie Carnegie, this piece comes with matching earrings. Here I’ve used pearl studs and bracelet to let the brooch stand out. This piece also looks lovely on a dress or blazer in a warm color other than coral. To me, nothing says “summer” more than polka dots. And this Brown Marbled Bakelite Art Deco Bangle has them! 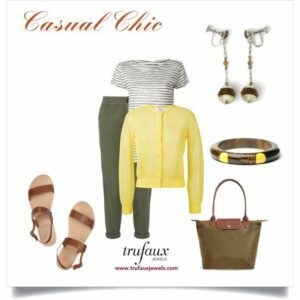 In Casual Chic, I’ve styled it with a cardigan, jeans and tee shirt in a warm palette, but you could also wear this bracelet with office attire in warm colors. These 2 ¼” Golden Topaz Rondelle Art Deco Earrings are fun to wear for work or play. 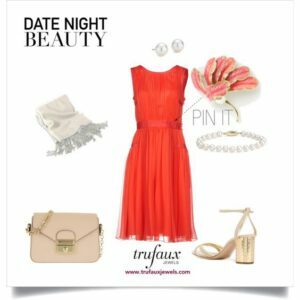 Day to Night (on the right) is a dressier look, featuring a Turquoise Bead & Diamanté 1950s Bracelet, to play up one of the colors in the dress. My boutique has two of these bracelets for sale as well as the matching earrings and necklace. In the 1950s, one would have worn the entire set (or parure) at the same time, but I think that’s a bit over-the-top for today. Instead, I’ve added real or faux diamond studs and a studded handbag. 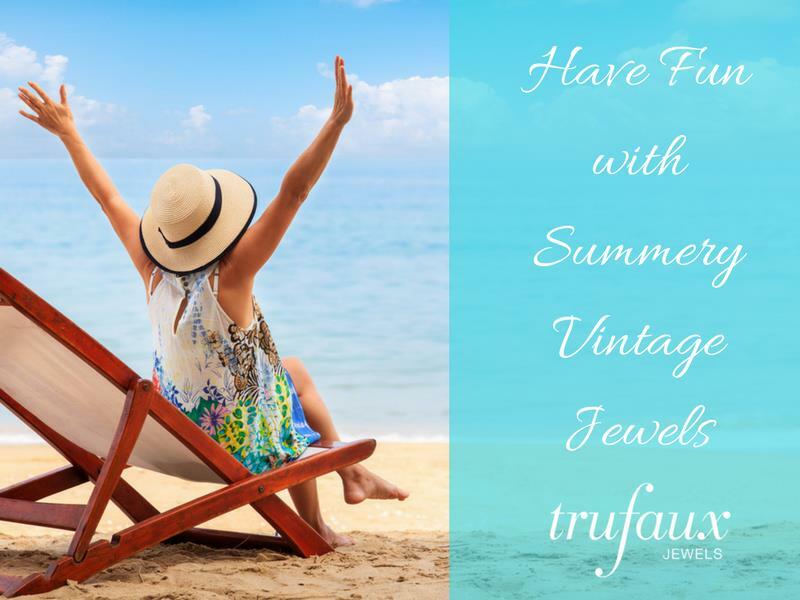 Take a look at the Summer Fun collection for more earrings, necklaces, brooches, and bracelets selected for this season. I like these summertime looks!